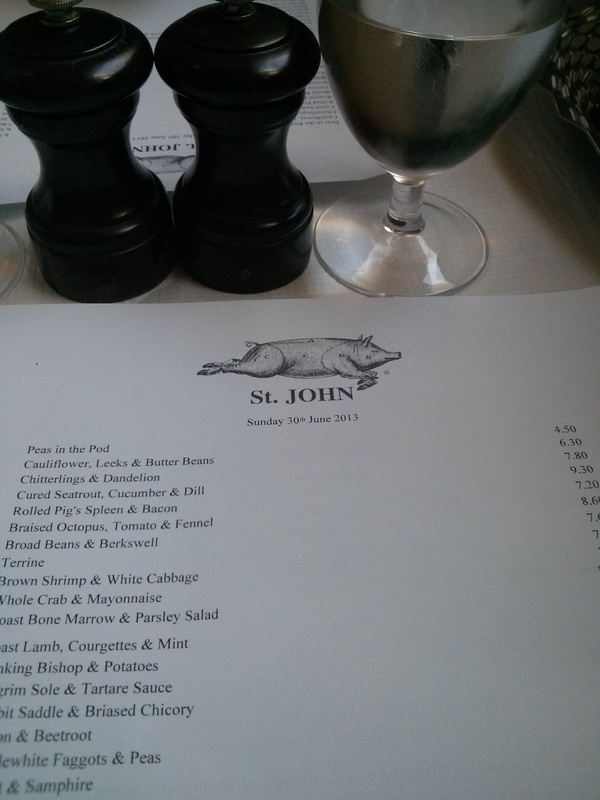 St John is some what of an institution on the London restaurant circuit; well for the carnivores amongst us, at least. Their ethos is Nose to Tail eating – so expect an offal heavy menu with animal parts you may not have tried before (deep fried tripe, anyone? ), that are served in the traditional way with no fuss. The original Smithfield restaurant (there’s now one in Spitalfields and a bakery in Bermondsey) opened in 1994 in an old smokehouse in Farringdon. Because of its heritage it’s sure to be one of, if not the, original London restaurant to offer an extremely stripped back and simple dining experience, which continues through into the decor. White walls, old wooden floor boards and industrial lights hang from the ceilings in the mezzanine restaurant area, with the ground floor bar space below. Because of what the premises once was, there are few windows, making the restaurant rather dark compared to the bar area, but pleasantly buzzy on the Sunday afternoon that we ate. White table cloths complete the look, including a thin paper one like you get in far less fancy Chinese restaurants. I’m not sure if this was a practicality because some of the dishes can get quite messy (whole suckling pig, bone marrow in the bone) but this was taking the pared-down look a bit too far, considering the price we were paying and the Michelin star. Running along the side of the restaurant is the half-open kitchen, and it’s always great to see the masters at work. To start we had chitterlings (intestine) with dandelions and one of the St John signature dishes – bone marrow with parsley salad. The chitterlings had been lightly coated in flour and fried in butter and were deliciously sweet and surprisingly delicate in flavour, quite far from the rich-and-strong-smack in the face you get with some offal. 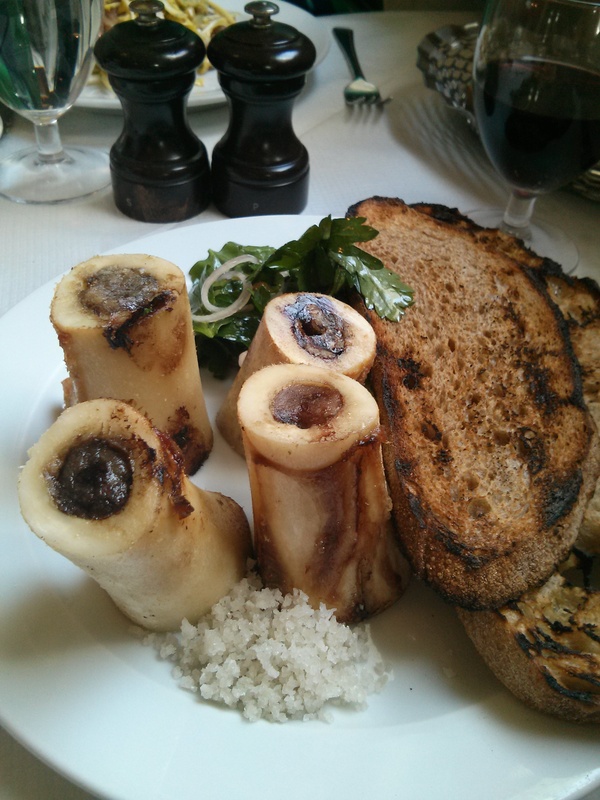 The marrow was a bit of a fiddle to get out of the bones, but utensils helped us out and the fruits of our labour teamed with the fresh and sweet parsley and onion salad cut through the grease of the marrow perfectly. Main courses were faggots and pigeon. The faggots were full of flavour, seasoned with lots of herbs to give them a peppery, spiced taste, however the gravy was a little disappointing – being thin and not tasting of much – I suppose to keep the faggots centre stage. Peas were also a little over-cooked. The pigeon left something to be desired too. It was slightly tough and not as pink as I’d have liked, despite our server making a point of asking whether I was OK with it being rare when I ordered. Pairing with earthy and sweet braised beetroot worked well. We were encouraged to order another St John speciality, the Welsh rarebit, and we weren’t disappointed. Cheese on toast isn’t something you’d expect on a Michelin-starred menu but this was one of the best things we ordered. A thick hunk of white bread, toasted to perfection with crispy crust and soft, but firm centre, lashings of melted mature cheddar mixed with cayenne pepper and Guinness (the secret ingredient), and the obligatory drizzle of Worcestershire sauce to finish off. The perfect comfort food. Dessert was an irresistible peach crumble cake. A texture extravagana with the layers of moist sponge, gooey fruit and crunchy crumble, which unfortunately was not done justice by the rather average vanilla ice cream it came with. Service was helpful and unfussy – far more friendly than lots of other high profile London eateries. We also needed quite a bit of help with the menu as meat parts had been given unfamiliar names in some cases, I imagine so as not to scare people off. I always ask for food and wine recommendations and our server was happy to oblige, even when asking which was the better dish between two (often you’re told that everything is good). A candle in our dessert as we were celebrating a birthday was also a lovely touch. Great value for the quality and reputation of the place. St John is firmly on the London restaurant map, especially with its Michelin star, and so prices could easily be inflated without putting people off. 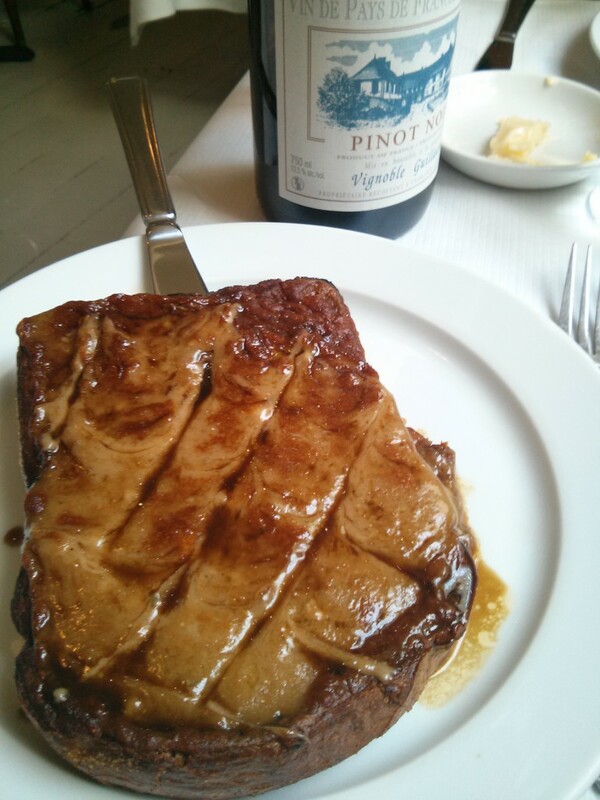 The Welsh rarebit was to die for, as was the velvety smooth and fruity Pinot Noir and the experimental first courses. However, both of our main dishes were in need of a little more care. My pigeon was over-done and there’s no excuse for bad gravy. Love this – sounds like a very interesting place. Im often embarrassed to ask restaurants to ‘decode’ their menu, but it sounds like they are friendly and helpful here, rather than snooty. Yes there were a handful of fish and vegetable dishes, like cured trout, dill and cucumber. However, they are famous for the offal so it would be a shame not to try something! Unless you’re a vegetarian, of course.